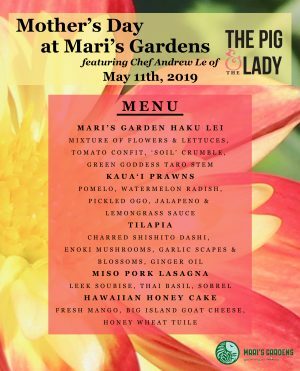 For tickets and more information, visit our website marisgardens.com or call us at (808)625-2800. Sign up at LocalInside.org using our promo code MGPROMO to waive your membership fee (valid until the end of April)! Visit us tomorrow & every Sunday at @hfbfarmersmarkets in Mililani! Swiss Cheese🧀 and Satin Pathos✨ Our bestsellers are back in stock, get em while they last! Today’s harvest of Beets and Carrots🥕 featuring Farmer Liz! Great place to browse for plants, pots, rocks and stone pavers. They also have a place to have a party. Friendly service and parking. Decided to visit this place on a whim... a lot of my co-workers rave about how fresh and beautiful the produce is... so we took a drive! Such a lovely place to visit with friendly and helpful staff! Lots of beautiful plants and pots and accessories.... and beautiful delicious organic produce! I want to preface this review by saying that the other of this fine establishment is my childhood friend, and of course there is going to be a little bias. He gets the automatic "braddah-braddah" star. So by my math that would put him at 11 stars. Too bad I... read more can only give it 5. If you're looking for fresh island produce, amazing succulents, or planters big and small, this is your place. I've had a recent fascination with succulents and Mari's has everything I need to get them looking just right. They have ceramic planters big and small for all your needs. Come here if you're looking for that something special to as did to your garden or to indulge in the islands best produce. I love, love, love Mari's Gardens and that's because I work there!! I just want to thank everyone for the awesome reviews and comments on Mari's Gardens!! I am very happy to know that y'all enjoy our produce and our landscape supplies and of course, my favorite...succulents!! Some of the goodies I've enjoyed is micro greens, edible flowers, breadfruit, limes, Swiss chard, pitaya. I only eat organic so I stick with Mari's produce. They also have plants for sale, local packaged foods and drinks, locally made jewelry and everything you need to start hydroponic, aquaponic and succulent gardening. 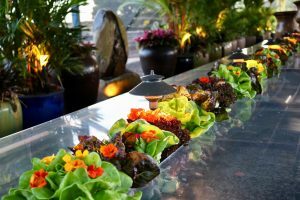 They host events throughout the year: Cultivating succulent classes and pop-ups of various chefs. The staff is very friendly, always telling me useful tips. The selection of plants is great and reasonably priced. I attended a private event there one afternoon... and my kids and I enjoyed it! The staff there are so patient and wonderful! They took the time to answer all my aunts questions about the succulents... and all my uncles questions about building an aquaponics/ hydroponics garden at home. They took... read more us on a little tour before starting the party... and it was interesting learning about how they grow their lettuce. I know my children have gone there on field trips... to learn about the garden... and I'm so glad I'm able to see what they learned! I was surprised they held private parties there! My cousin had her baby's first birthday party dinner there... and it accommodates about 60 people, so that was way more than enough room for everyone comfortably. I was just so amazed at the beautiful tables! So much fun to be had!!! A friend of mine sent me a flier for a succulent garden class happening at Mari's Garden so I decided it would be a fun way to celebrate a friend's birthday. The four of us reserved our spots in the class, not being too... read more sure of what to expect. It was a $25 fee, BYOvessel. I never knew the hidden treasure that is Mari's Garden was in Mililani, or that it was surrounded by a residential area. We arrived, parked and walked in to pay our class fee. Since we thought we had to bring our own pots, we did, but you can also purchase on site. A new friend introduced me to Maris garden. It's an amazing place nestled in a residential part of Mililani. Aquaponic gardening of beautiful fresh vegetables, succulents and a cute little store with fun treasures. The day I went they had school children there and were giving them a presentation about... read more the garden. The people are so nice! I bought Manoa lettuce, nice sweet onions and amazingly sweet corn . I was told their pots are in sale so if you are in the market for pots, go now! Found a hidden Gem. Rows and rows of succulents, a small produce section and even local made jewelery. Aunties and Staff kind and helpful. Will be a regular for sure. Thank you! About 3 weeks ago I found out my daughter's school had a field trip planned to this place. When I asked her teacher where it's located she said "Mililani". Wait what?! How did I not know about this place when it's only a 10 minute drive from our home...in MILILANI!... read more Well I yelped this place wanting to know more and got really jealous that my daughter was coming here. Well fast forward to today, the day of her field trip: asked her how it was and she had a blast! My plan was to come on Saturday but I honestly could not wait. I felt like a child wanting to go to the toy store! My husband, daughter, son and I were actually heading to Safeway to go some grocery shopping but I wanted to check out Mari's Garden beforehand. Everyone agreed and it was literally only a minute drive away from Safeway. It's hidden in the residential area, no one would've ever guessed this place would be here. Upon arrival we were greeted by a young man with a smile even if he was busy talking to someone. When we entered the market we were greeted by a very sweet woman inside and even a customer chatted with us. She seemed to be as happy as I was being at Mari's Garden. Ha! My family of 4 could've spent a lot more time (and money) in there if we weren't in such a rush to go shopping. My daughter, still in her school uniform, was asked by the employee if she was there earlier for the field trip. She nodded yes and the employee was incredibly happy that she had brought her family back. Right before she rang us up for our items, she gave my daughter a beautiful Mari's Edible Gardens to take home to try and some stickers as a thank you. Thanks great customer service great workers at Mari's Gardens. I'm happy with what I bought here. We chose this venue as a place to have our staff retreat. Most of us didn't know what to expect, but were told that it would include a farm to table experience, a tour, and some team building activities. When we arrived we... read more were greeted by a tour of the gardens. 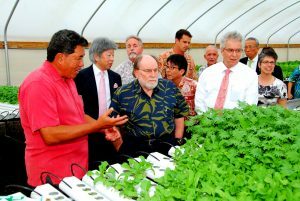 I was amazed of the variety and even more wowed by all the aquaponic systems. The fish were huge! I can't lie, I thought about how awesome it would be to fish and eat one- but we didn't get any fish for lunch. We did have an AMAZING lunch. Everything was freshly made. My favorite dish was the ulu mash- I could eat that every day for every meal. After lunch we did some team building activities, got to shop at the store, and was blessed with a bag of lettuce. Fred, Norma and Tanya, amazingly helpful and excellent service. Wide range of options, great value, personal and professional. Thanks so much!! I'm a teacher, and they were very accommodating and flexible with our school group. The tour guides provided us with a lot of good information. You can even take home plants! We had 2 classes go, and we split into 2 separate groups--1 class went on the tour, while the... read more other class planted their plants. They have both hydroponics and aquaponics. Our tour guide did know a lot, even though she was only there for a few weeks. The people in charge of handling groups were also good about replying in a timely manner when I had questions. The one "negative" was that some of the information on the website was different than what they email school groups, so when I pulled pricing information from the website and compared it with information that they emailed, it was a little confusing. A date night to impress! Dinner in the middle of the largest aquaponic farm in Hawaii. Farm tour, 7 farm to table appetizer stations by @pokestop , and live entertainment. This one-of-a-kind meal features fresh, organic local ingredients. The Staff here is amazing! They are so friendly and passionate about what they do and willing to take the time to answer questions. Excellent produce and beautiful scenery! Great to know that local places like this are around teaching future generations about sustainable agriculture. Love this place! Great prices on plants. Manager Lane is very knowledgeable, very helpful, very professional. He treats his customers like family. This is the place to go for great values on outdoor pottery. They also have a great selection on plants and will walk the property to help you... read more find what you need. We just bought a finger lime. We did not even know that such a thing exists! I love Mari's Garden produce and I also love Gardens! While shopping at Chef Zone, I bought a bag of baby romaine and it happen to be Mari's Garden's produce. I am amazed at how fresh the romaine taste, I did a Yelp search and came across one of my... read more Yelp friend's review. Ever since that day I purchased the romaine, I had Mari's Garden bookmarked for the longest time. I wanted to check out the garden, since I love the produce so much and I am super Happy, I finally did, this past week. I took my family along, made it a family outing and also brought my mom and sister. I had to bring my mom as she is the one that loves gardening and this is the reason that I love gardens! It is tucked away in a residential area in Mililiani, As other Yelpers mentioned, you would not know there is a garden in this residential area.. It wasn't hard to find, per our phone's GPS it lead us directly to the gardens. You will see the huge Mari's Garden sign, parking is right out side in front of the fence. Be prepare for the little rocks as you exit your car. I am weird but I did get excited before my trip to Mari's garden, I thanked my other half for driving me here. As you enter,In the front of garden, there are plants and pots for sale. Potted plants are limited. The friendly general manager that we met that day, he is in charge of sales, he mentioned that whatever you see at the garden, it is for sale! He mentioned the Buddha in front of store, has been sold. I headed straight into Mari's store, which is where you will find produce for sale, along with other items. I already had the baby romaine lettuce on my mind. I purchased 2 bags of romaine along with Reed Avocado, which is from the garden. Besides produce for Mari's garden, they also have produce from 2 other farms, Aloun & Ho Farms. I think this is a good thing to sale produce from other farms and not just Mari's Garden. *Honeydew, Cantalope, Thai Watermelon, Kabocha, Long Beans, Okinawan Sweet Potato, Eggplant, Zucchini,& Apple Banana, all from Aloun Farms. At Mari's store, you will also find salad dressings, few local products, t-shirts, succulent plants, and a little jewelry kiosk near the entrance. What can you do at Mari's Garden? You can learn a bout Aquaponic and Hydroponic systems, from what I read, Mari's Garden has biggest aquaponic farm in the state. 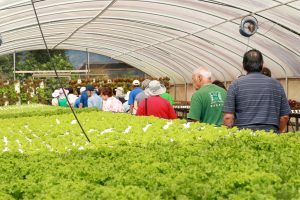 During my visit, we were lucky to get a tour of the farm, ( check on line for tour information, 2 types of tour are available and no tours on weekends) The tour was so cool, I got to see the hydroponics, where all lettuce are planted. There are tons of them, I got to see all the fruit trees, behind the scenes. All this takes place on 17 acres of property, which was previously owned by the Watanabe's. What I also learned is nothing goes to waste at the garden, I saw goats during our tour, they feed the goats the old produce. I enjoyed the behind the scene tour of Mari's Garden. 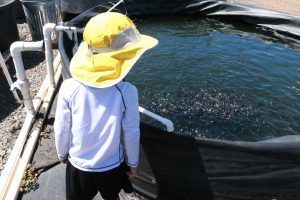 Oh, from their biggest Aquaponic farm, fresh tilapia are also for sale at 12.00 lb. Mari's Garden is named after the owner's daughter, who is now away in college. Mari's Garden was established in 2007. Overall, I had a wonderful first time experience visiting Mari's Garden. I was happy to get my produce directly from the source, Mari's Garden. Come check them out, support local, you won't be disappointed! Before I end my review, once you taste Mari's baby romaine, you will want only Mari's romaine. It is really fresh and I can taste the difference from Mari's and the romaine from other source. A bag cost 3.99 which comes with 6-7 romaine, thats cheap!! A quick FYI: Mari's Garden is opened from Tuesday-Saturday, 7:00-3:30 PM. Decided to visit this place on a whim... a lot of my co-workers rave about how fresh and beautiful the produce is... so we took... read more a drive! Such a lovely place to visit with friendly and helpful staff! I want to preface this review by saying that the other of this fine establishment is my childhood friend, and of course there is going... read more to be a little bias. He gets the automatic "braddah-braddah" star. So by my math that would put him at 11 stars. Too bad I can only give it 5. I love, love, love Mari's Gardens and that's because I work there!! I just want to thank everyone for the awesome reviews and comments on... read more Mari's Gardens!! Great little neighborhood store for picking up fresh, local organic produce. They also sell veggies from several local farmers like Aloun Farms. They have lettuce-butter,... read more romaine, different colored. Sometimes manoa-if you ask. Eggplants, cucumbers, green onions, tomatoes are usually available, but selection depends on what's being harvested at that time.